This 35ft Classic Bertram powered by twin 370HP Cummins diesels out of Los Suenos Marina in Playa Herradura has experienced American Captain Bill Kieldsen at the helm. 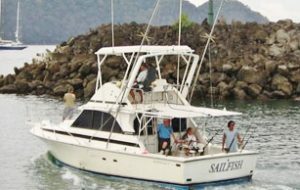 This fast and comfortable boat with a/c salon and fighting chair is fully equipped for fly-fishing and conventional fishing with live bait. It carries Shimano Gold Tiagra reels, Penn International fly reels and custom rods, and multiple teaser stations for bait-and-switch.